When a client who has never had a custom closet comes to see me, we start from scratch with needs, hopes, and desires. Then the designer in me begins to imagine endless possibilities that work with the homeowner’s belongings and budget. In this case they described what they had before – serviceable closets without much interest. I knew immediately that we could do much better than what they were replacing; we could create something way beyond ordinary for their home. We met at the showroom to talk about details and the basic design for each closet. This is where the process got fun. As we wandered the showroom and looked at options for colors, finishes, hardware, and configurations, they began to say things like “wouldn’t it be nice,” and “what if we added,” and “I’ve always wanted.” The result was a houseful of beautiful, functional closets personalized for them. 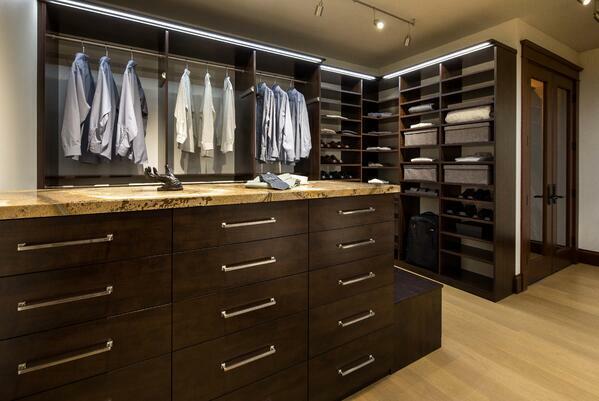 In the master bedroom closet we created His and Her dressing rooms. As we discussed colors and finishes, she was set on light and airy but he wanted something a little more masculine which would to take into account the reddish wood trim already in place in the room. They also had very different wardrobes, with items that needed to be accommodated with specific design features. This gave me a chance to create unique closets for each of them, so both are organized, and their closets fit them perfectly. For the “His” area, we opted for Belgian Chocolate Thermally Fused Laminate (TFL) which was a deep, warm color that would coordinate well with the existing wood trim. A combination of hanging clothes on side walls and shelving on end walls gave him the ability to organize shoes and folded clothing as well as hang his work clothing. Since he’s tall, we gave him double hang rods with extra space both top and bottom to accommodate longer shirt tails and jackets. To insure he could tell the blacks from the blues, we added a strip of LED lighting all the way around the top of the closet. An island, or more precisely a peninsula, contains drawers to organize small items and accessories. He was particularly delighted with the bench on one end to sit while he put on his shoes. 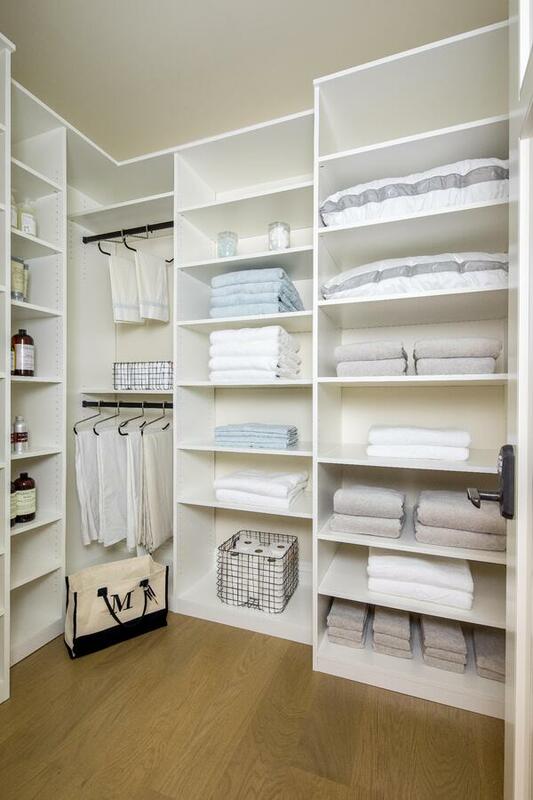 In “Her” closet we settled on Bianco Textured TFL with Shaker Style door and drawer fronts for a fresh, bright feel. We gave the closet additional interest with a pop of color by painting the wall behind the open shelves and hanging rods a rich blue. Since she had a significant number of formal dresses, we gave them plenty of space. Two full-length wardrobe style closets were set aside for formal wear, with another closet for everyday dresses. Detailing on the cabinet doors was important here to give the closet a sophisticated appearance. I pinned separate top and bottom doors together for single full height, easy-opening doors. We even put in a locking cabinet so she can hide gifts from the kids! The center island houses drawers for accessories and a tilt-out bin for dry cleaning and laundry. She also dreamt of seating at one end of her island so she wouldn’t have go to another room to sit to put on her shoes. After we had designed the closet to accommodate all of her clothing and accessories, she began considering what to do with the open space above the cabinets. “We’ll put our luggage up there,” her husband said. The look on her face was priceless! She was appalled that he wanted to clutter her beautiful new space with luggage. I may have saved this marriage with a simple suggestion: Put another row of cabinets on top and hide the luggage behind closed doors. The result? 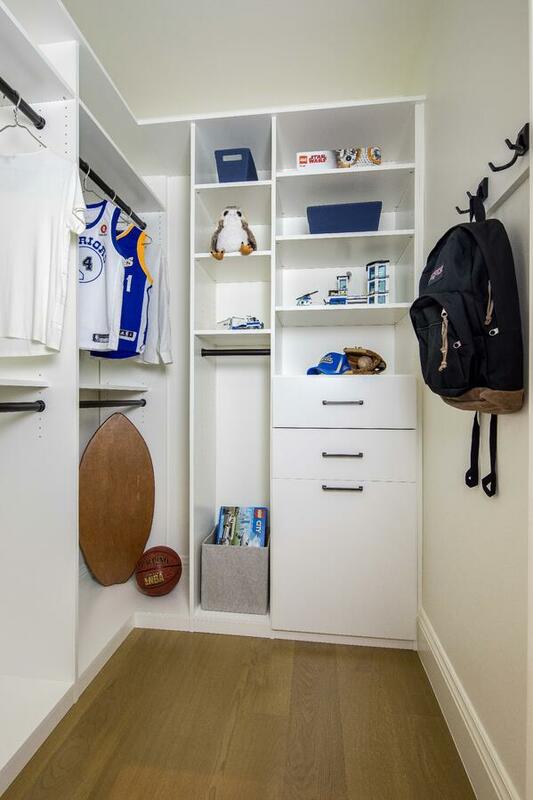 He gets the storage he was eyeing, and her closet looks serene and uncluttered. Once the master closets were designed it was time to turn our attention to the rest of the house. For the linen closet, the family needed space to organize and store not only sheets and towels, but toiletries and paper goods. The key to keeping a space like this organized is having adjustable shelving. As the needs of the family change, the closet continues to fit. I avoided cabinet doors for the linen closet because being able to see the items on each shelf makes it much easier to plan shopping and laundry activities. Besides, since this closet stays behind a closed door, there is no downside to having open shelves. Hanging rods provide a place for bedspreads and tablecloths to be stored without getting creased. And the white TFL gives the room an open, airy, clean feel. For the son’s room, we again chose white TFL which is easy to clean. Since both Mom and Dad are tall, we expect that Junior will be as well in just a few years. Again, adjustable shelves mean that as he grows, the closet will grow with him. We prioritized hanging rods since Mom hangs most of his clothing when it comes out of the wash. No closet doors allows him to see all his options when getting dressed in the morning. A few shelves for folded items along with some drawers for underwear and socks gives him plenty of space for everything. And the tilt-out laundry bin makes laundry day a breeze. I truly enjoyed the variety of spaces I designed for these home owners. 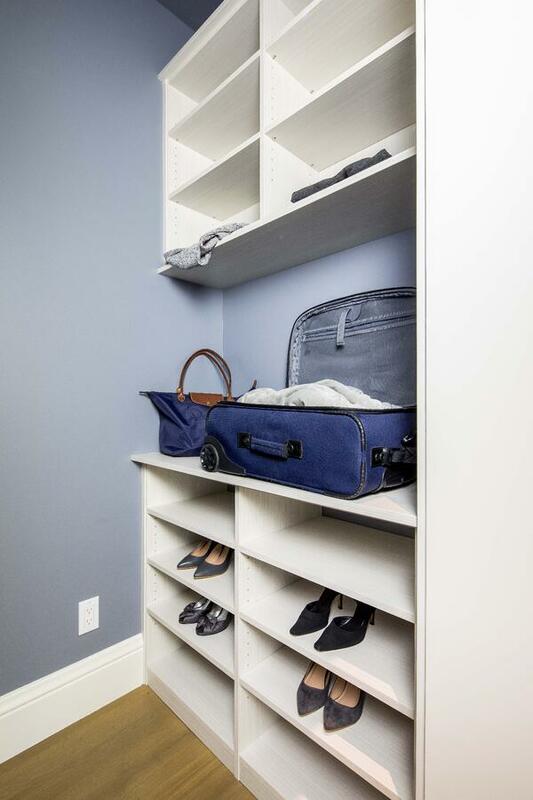 It’s a great feeling to give them what they need for their closets, then add those unique design features that make using each closet a daily delight. The result is a house full of beautiful, functional closets that will grow and change as the family does, to fit them perfectly now and for years to come. If you need to reimagine your space, please visit one of our Valet showrooms, or call to speak with me or one of our other expert designers. We can help you maximize your space with a solution created just for you. Karin joined Valet in 2010 and brings a unique combination of marketing and design experience to our team. 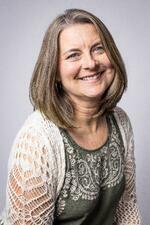 Karin graduated from UCLA and enjoyed a successful career as a sales and marketing executive. She later earned an interior design degree to pursue her creative inclinations and passion for space planning. Karin excels at listening to customers and understanding their needs. She grew up on the peninsula, loves to travel, ski and spend time with her husband and two teenagers.